I am always looking for unique ways to decorate in a rustic chic style that will grab a person’s attention and keep them talking about it at length. Fortunately, I have found several super cool, over the top, mind blowing decorating ideas that will be sure to capture the interest of the rustic decorating enthusiast. 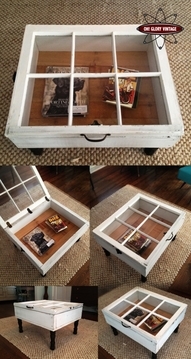 It’s a fun rustic chic coffee table! I love the fact that the window top lifts up for storage inside the table box. Old Glory Vintage makes these from vintage windows. I know where I can get several windows like these. 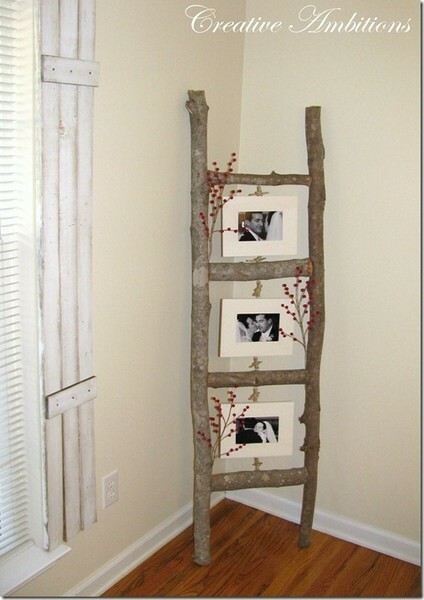 Now if I could only find old drawers in the exact dimensions of the windows…..
A ladder for holding framed pictures…..I love this idea by Creative Ambitions! You can vary the color by the type of branch that you use. This looks like a white pine and I love the gray coloring against the white background. What a great way to get instant character! For a decorative hanging accent in a room, how about attaching a suspended tray of candles from the ceiling like this idea by Desire To Inspire? I don’t know that you would actually light the candles but the look is still warm, unique and full of rustic simplicity. If you have a welder, you could create a hanging tray like this one out of metal. Otherwise, you could also make something out of wood and maybe hang it from some rustic chain. A chain coming up from each of the four corners of a wood tray attached to four hooks from the ceiling should work perfectly! There is so much that I love about this setting! 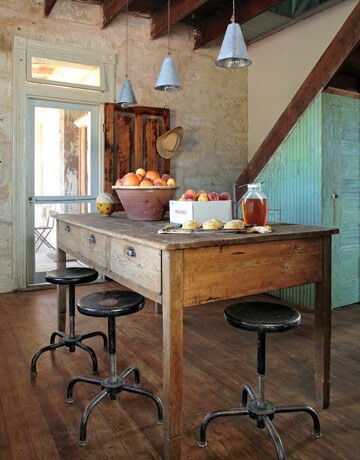 The wood table and the metal stools are perfect rustic touches for a country kitchen. However, the highlight is actually above the table. These pendant lights are made from twisted wire and old tin pots! Would you have guessed? 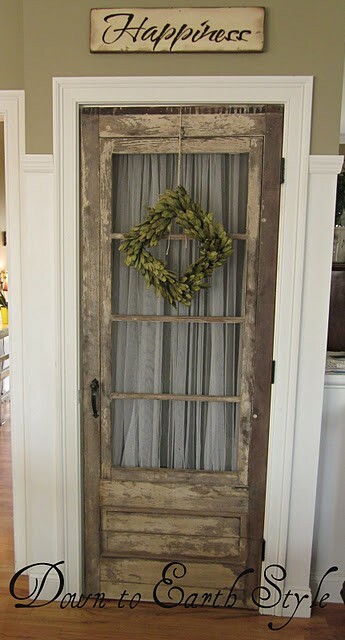 What was your favorite rustic decor idea? Would you consider trying any of these? Do you have some unique decorating ideas that you would like to share? I would love to hear your thoughts! I love it. What a great way to take the usual and make it totally ‘unusual’. Great job! Thanks Karen! I’m glad you liked the ideas. OMG, love that door! And the kitchen worktable! 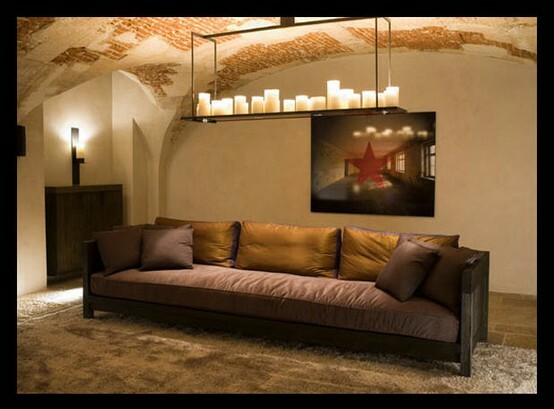 The hangling candles are a really cool idea but it looks more Industrial to me. I’m glad you liked them Tee! That door was one of my favorites too. Now I’m going to be on the search for cool vintage doors! what kind of door is it and where did you find it? i’m in love with the window frame table! i have several old windows, (even a square one with stained glass butterflies!!!) . awesome window table! i have an old stained glass window that would really be pretty!